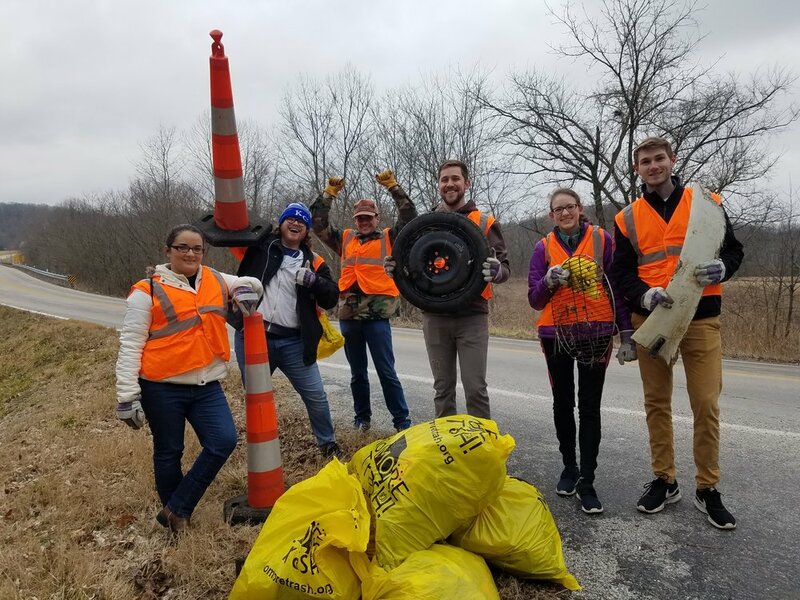 I volunteered with the James River Basin Partnership’s Adopt-a-Highway clean up on Friday, March 1st. JRBP is a nonprofit organization that works to protect and improve the quality of the waters in and around the James River Basin in Southwest Missouri. They promote sustainability through highway clean up events, river clean up events, Earth Day celebrations, native plant sales, and many other projects designed to get the public involved and interested in water conservation and management. One of the first things you see when you log into the JRBP website is the quote “Envisioning clean water for you, your children, and your grandchildren.”. This quote perfectly encapsulates JRBP’s commitment to improving and maintaining our water and natural resources for the future generations. The mission statement itself states that JRBP is “working to improve and protect the water quality of the springs, streams, rivers, and lakes in the James River watershed”. I believe that JRBP does an excellent job of promoting its goals. Since their founding in 1999, JRBP has improved the water quality in the James River and Table Rock Lake. Algae blooms are now far less common, and they are less harmful when they do occur. The clean up events in the rivers and on the highways greatly improve both aesthetic value and cleanliness of the waters that the local people use for bathing, cooking, swimming, fishing, and boating. When people attend these clean up events, they learn to appreciate how much work goes into maintaining a water source. Raising public awareness of the harms of pollution and littering will help to reduce the amount of these things dumped into the river in the future. The Earth Day celebrations and native plant sales teach people to appreciate our environment for its natural beauty and value. Improving the beauty of our rivers and lakes will increase tourism, which is good for the local economy. JRBP is a force for good in the James River Basin area, and I believe the world is a better place because of them. Anyone with even a slight interest in natural resources and outdoor recreation should attend one of their events or volunteer with a clean-up project. They’re a lot of fun, and they’re a great source of environmental knowledge. Before beginning this project, I’ll admit that I was a bit disgruntled about having to give up about three hours of my time on a Friday night. I did not think I would have any fun or that I would think the project was worthwhile. My mind was quickly changed upon meeting with Brent and Todd. They were both very welcoming and kind, and we had some very interesting discussions about the state of the local ecology. I grew up wandering the woods and watersheds of mid-Missouri, so this was a wonderful experience for me. It was very refreshing to be able to get away from the sounds and sights of the city for a bit. The scenery was beautiful, despite the cold and cloudy weather. Our efforts were rewarded with almost ten trash bags full of plastic bottles, fast food cups, cigarette butts, beer bottles, and crushed cans. In addition to the usual garbage, we also found a nearly-new pair of sandals, a working vinyl record, a spare tire, and the grate off of a barbeque grill. (See the photo gallery below) Along the side of the road, we were greeted by some curious dairy cows who were more than happy to stand right at the edge of their fence, posing for photos. The hike along the one-mile stretch of road was quite the workout, but it felt great to stretch my legs a bit while doing something good for the community. This was a very rewarding experience, and if given the opportunity, I would be happy to do it again. Sabrina examines one of the like-new Keen sandals we found along the highway. The JRBP staff had to look this artist up on YouTube. Older PostWhat's in our urban streams?